Heart Disease is the Leading Cause of Death for African American Women. Here's What We Should Know. Do you know that Heart Disease aka Cardiovascular disease is the leading cause of death among African American women? If not, it goes to show that we aren't necessarily aware of our health issues, let alone what we can do about it. Sooooooo, with this being black history month the National Coalition for Women with Heart Disease is doing their part to get the word out about this deadly disease and asking us to do the same. Here are some facts that we all need to know that can make the difference between life and death. • Cardiovascular disease is the leading cause of death for African-American women. • African Americans have a higher risk for cardiovascular disease than Caucasians and are less aware of their cardiovascular risk factors. • For African American women over the age of 18, the rate of coronary heart disease is directly related to education, income and poverty status. • More than 15% of African American women say they are in fair or poor health, compared with 11% of Caucasian women. • African American women have higher rates of obesity, high blood pressure, diabetes, stroke, and heart failure. • 81.9% of African American women are overweight or obese. • 62.5% of African American women do not meet the 2008 Federal Aerobic and Strengthening PA Guidelines for Adults. (consisting of either 150 minutes of moderate leisure-time physical activity per week or 75 minutes of vigorous activity per week). 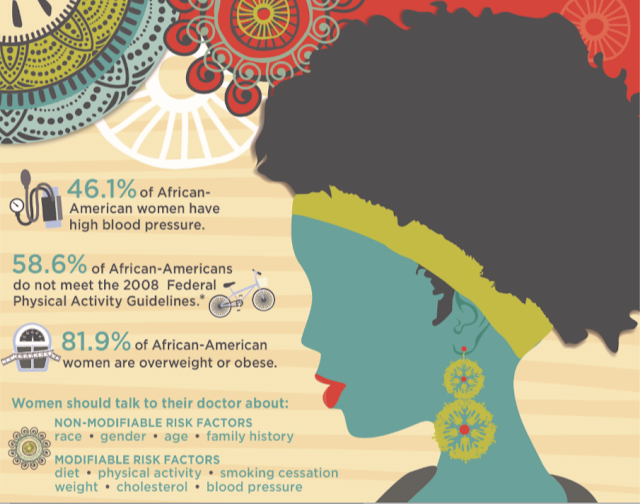 • 46.1% of African American women have high blood pressure. • African Americans bear a disproportionate burden of stroke, hypertension-related heart disease, congestive heart failure and renal dysfunction. • African American women are much more likely to lack a usual source of care and to encounter other difficulties in obtaining needed care. • African Americans, both men and women, have had a long history of poor access to health care which continues today. • African American women, despite their higher risk of heart disease, were 10% less likely to receive aspirin and 27% less likely to receive cholesterol-lowering drugs. • African Americans have not historically been enrolled in studies evaluating the treatment of cardiovascular risk factors or outcomes of lifestyle modification in the same numbers as their white counterparts. Know the Signs. Know What to Do. The most important thing to do if you think you are having heart attack symptoms is to call 911 and tell them you are experiencing heart attack symptoms. They will send an ambulance to transport you to a hospital emergency room as quickly as possible so a doctor can examine and treat you. While waiting, crush or chew a full-strength aspirin (swallow with a glass of water) to prevent further blood clotting. How can you tell if you are having a heart attack, stomach indigestion, or simply arthritis pain? There are definite early warning signs and symptoms of heart attacks. Women can experience all, some, a few, or none of these symptoms. Only examination by a doctor, who will administer an electrocardiogram (EKG) and/or a blood test, can confirm if you are having or have experienced a heart attack. Some women mistakenly think only crushing chest pain is a symptom of a heart attack and, therefore, delay seeking medical care. Others have found that healthcare providers have failed to recognize their heart attack symptoms by attributing the cause of symptoms to other health problems, such as indigestion. This is why it is so important to insist that the doctor or nurse administer an EKG test or an enzyme blood test to see if you are having a heart attack. Don't be shy - it's your heart and your life! Have you or someone you love been impacted by Heart Disease?